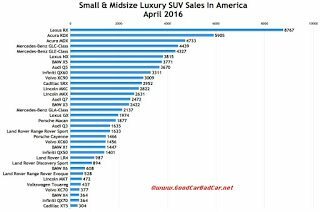 As U.S. sales of SUVs and crossovers grew 8% in April 2016, sales of small luxury SUVs and crossovers jumped 27% to 34,813 units. Together, 15 small premium utilities generated 6.2% of the overall SUV/crossover market, up from nearly a full percentage point compared with April 2015. 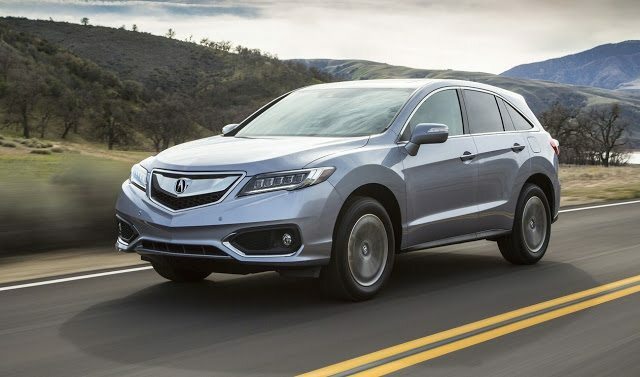 Leading the way in April was the Acura RDX, sales of which jumped 49% to 5905 units, the best month ever for the entry-level Acura crossover. Sales of direct and indirect rivals at Audi (Q5), Infiniti (QX50), Land Rover (Discovery Sport), Lexus (NX), Lincoln (MKC), and Mercedes-Benz (GLC) all grew at an above-market-average rate, as well. Acura’s MDX didn’t fare quite so well in March or through the first four months of 2016. Year-to-date, MDX volume is down 14%. Sales of its Honda sibling, the Pilot, are down 17% this year. Nevertheless, no three-row premium brand utility in America sells more often than the MDX. No premium utility vehicle of any sort sells more often than the Lexus RX, America’s top-selling premium brand vehicle overall. April RX sales jumped 29%, a gain of nearly 2000 sales, year-over-year. You can click any model name in the tables below to find historical monthly and yearly U.S. auto sales data. You can also select a make and model at GCBC’s Sales Stats page. 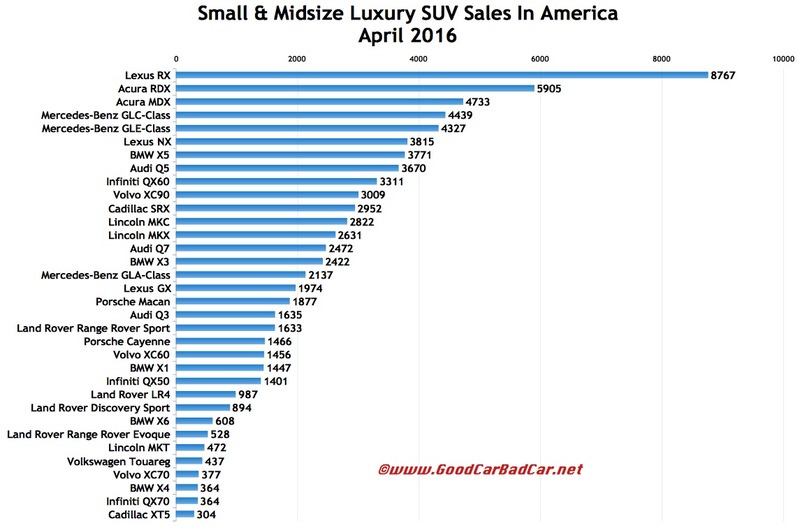 These tables are now sortable, so you can rank luxury SUVs and crossovers any which way you like. Suggestions on how GCBC should break down segments can be passed on through the Contact page.